Saturday, August 17 Seattle - Depart at 4:00 p.m.
Juneau - Arrive 1:00 p.m., Depart 10:00 p.m.
Wednesday, August 21 Sitka - arrive at 8:-00 a.m., Depart at 5:00 p.m.
Thursday, August 22 Ketchikan - arrive at 7:00 a.m., Depart at 1:00 p.m.
Friday, August 23 Victoria, BC - Arrive 6:00 p.m., Depart 11:30 p.m.
Saturday, August 24 Seattle - Arrive 7:00 a.m. The City and Borough of Juneau, commonly known as Juneau, is the capital city of Alaska. It is a unified municipality on Gastineau Channel in the Alaskan panhandle, and it is the second largest city in the United States by area. Juneau has been the capital of Alaska since 1906, when the government of what was the District of Alaska was moved from Sitka as dictated by the U.S. Congress in 1900. The municipality unified on July 1, 1970, when the city of Juneau merged with the city of Douglas and the surrounding Greater Juneau Borough to form the current municipality, which is larger by area than both Rhode Island and Delaware. Downtown Juneau is nestled at the base of Mount Juneau and across the channel from Douglas Island. In 2014, the population estimate from the United States Census Bureau was 32,406, making it the second most populous city in Alaska after Anchorage. Fairbanks, however, is the state's second most populous metropolitan area, with roughly 100,000 residents. Juneau's daily population can increase by roughly 6,000 people from visiting cruise ships between the months of May and September. 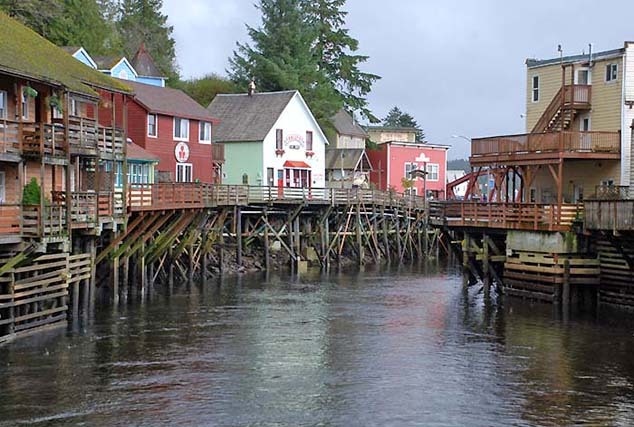 The beautiful community of Ketchikan is situated along the shores of Alaska's Inside Passage within the heart of the sixteen million acre Tongass National Forest. Evergreen mountains rise out of the water, the lush green landscape nurtured by the abundant rainfall of the temperate rainforest environment. The community is comprised of three islands, Revillagigedo, Gravina and Pennock and transportation between them requires a boat or ferry ride across the Tongass Narrows. Ketchikan is 90 minutes by air from Seattle and 36 hours by sea. The second largest cruise port in the state, they are a popular destination for independent minded travelers too, due to superb fishing, outdoor recreation, thriving Native culture and amazing scenery. The bounty of Wild Alaska seafood offerings at local dining establishments is yet another delicious reason to visit. 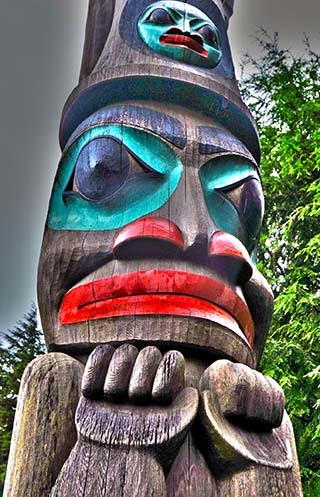 Home to 13,700 year around residents, Ketchikan is a vibrant, hard working community. One of "America's Top 100 small arts communities" Ketchikan’s impressive variety of shops and galleries feature work by many of the island’s resident artists and an assortment of souvenir items and unique gifts that make shopping in our community a must do for any traveler. This close knit community of 13,700 offers visitors a remarkable array of activities and attractions that highlight the town's history, industry and culture, bring you up close to the resident wildlife or transport you into the midst of wilderness. Positioned on the Alaska panhandle west of Juneau, Glacier Bay National Park, a UNESCO World Heritage Site, is managed by the U.S. National Park Service. Glaciers descending from high snow capped mountains into the bay create spectacular displays of ice and iceberg formation. In total the park and preserve cover 5,130 sq. miles (13,287 sq. km). Most of Glacier Bay is designated wilderness area which covers 4,164 sq. miles (10,784 sq km). Wildlife in the area includes both grizzly and black bears, moose, sitka black-tailed deer, mountain goats, dall sheep, wolves, Canada lynx, sea otters, harbor seals, Steller sea lions, Pacific white-sided dolphins, orcas, minke whales, humpback whale, bald eagles, gulls, waterfowl, and salmon. Please contact us to begin your adventure! You can fill out the application on our website and mail that in and then call in your credit card information.